If you frequently use email for your business then you likely are sending the same, or very similar, emails over and over. For instance, in some cases you are sending an introductory email to a prospect, scheduling an appointment to meet with a prospect or client, or answering frequently asked questions over and over again. Not only is this monotonous, but it's also counterproductive and takes up a lot of valuable time. 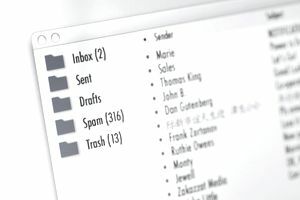 Many email programs provide the option of creating email templates to streamline the process of sending these repetitive messages. In Gmail, the feature is referred to as canned responses. Rather than having to type each new email from scratch when creating new emails or responding to emails, Gmail's canned response system allows you to save the business emails you write on a regular basis. In the future, when you need to send an email or respond to a question, you simply can load the saved email—or, canned response—you created and saved and make any specific tweaks if necessary. These tweaks, or amendments, might be as simple as adding a recipient's name or modifying the answer slightly. It's important to have this option to modify because while you don't want to retype the bulk of the message over and over again, some custom-tailored edits still are needed to personalize your communications. As an example, you might need to email instructions to multiple people and 90 percent of the included instructions are the same for each recipient. By using the canned response system, you only have to type the common instructions once. Many people already use a similar method, by copying and pasting an email template from a document or text file into their email message. Since this functionality already is conveniently built directly into Gmail, the same thing can be accomplished in fewer steps. Click on the settings link in the upper right-hand corner. This is the icon that looks like a gear. Look for the feature called Canned Responses. If you can't find it then you can search for "Canned Responses" in the search bar. Select Enable, located next to the Canned Responses feature. Click Save Changes located at the bottom of the page. You will now be able to see a "canned responses" feature whenever you start composing an email. If you want to create a new canned response, start by composing your email. Then, using the arrow drop-down, select New Canned Response and name your new canned response. To use a canned response, open up a new email and select the canned response you want to use from the drop-down menu, and the text from that canned response will be inserted into the body of your email. You then can edit the canned response as necessary.